How does Santa know who is naughty and who is nice? 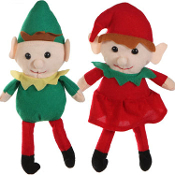 Have fun creating a new family holiday game tradition, with our cute, cuddly, soft-stuffed plush versions of the Shelf Elf toy dolls! SET of TWO (2) One BOY and One GIRL. Display together, or keep one and ask a friend to adopt the TWIN! Keep our little Santa’s helper pixie ‘’Behaviour NARC Informants’’ sitting carefully on a 3-inch or wider ledge, window edge, fireplace mantel, or any other place you care to perch one or both. Dressed in traditional Christmas Green elfen attire with cap and red scarf and hat trim. It’s the magical (sometimes mischievous) little elf that keeps an eye on everyone in the house, and flies back to the North Pole every night to tell Santa who’s been naughty and who’s been nice. Traditionally, this fun make-believe character Elf moves around the home every day from Thanksgiving until Christmas Eve and then returns every year. The story dictates that the elf's main priority around the family's household is to keep watch over the children's behavior during the day and return to the North Pole overnight to report their behavior to Santa Claus, detailing any acts of obedience or misdeeds performed by a child during that particular day, returning home by the following morning. Starting from the day following Thanksgiving to Christmas Eve, the elf remains with its family to ensure that they behave properly throughout the holidays. However, the top policy regarding the Shelf Elf is to refrain from touching the creature, as doing so could permanently erase any Christmas magic with which the elf had been bestowed upon being named by the family. If touched, it is no longer capable of fulfilling its duties of recounting the events of the day to Santa Claus, cautioning that he may or may not learn about a child's behavior should the Shelf Elf be stripped of its holiday enchantment. Every day, the elf's position should change, providing the family with the responsibility of locating its current perch before its departure for the year on Christmas Eve. -100% polyester velour fabric with poly fiberfill stuffing.